Why Is Copper So Important? A shiny copper still heated to a slow boil, working its alchemical magic to produce a steady trickle of precious spirit - the romantic and photogenic centrepiece of almost every distillery that comes to mind. 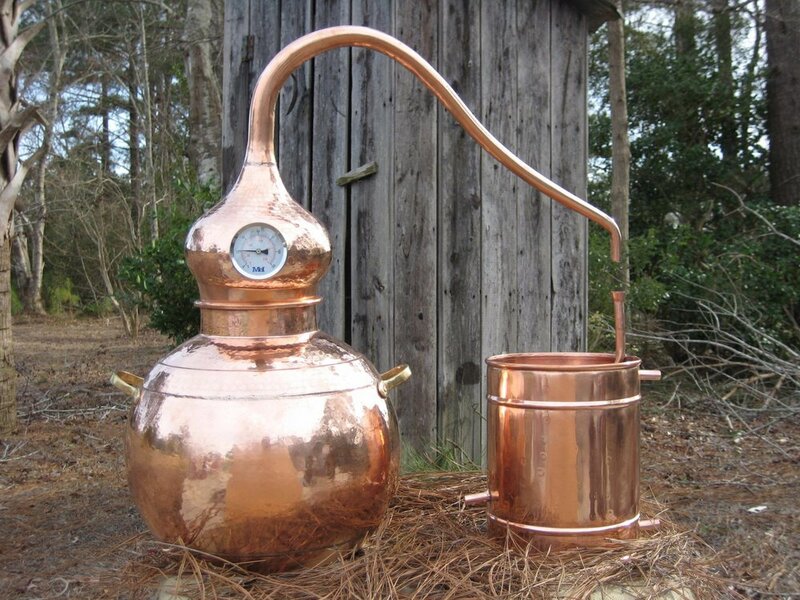 Traditionally, stills have been constructed entirely of copper, but with the rise of craft distilleries of all sizes, a myriad of different still designs can be found. These can be entirely copper, hybrid copper / stainless steel, glass / stainless steel, or even on occasion entirely stainless steel. What does this mean for the product? To understand when copper is essential in the process of craft spirit production and when it is superfluous, we need to delve back into the dark (and for some of us traumatic) recesses of our memory and remember some basic principles from high school chemistry and biology. Yeast is the key player in all alcohol production. Through a fortuitous quirk in yeast evolution, yeast produces alcohol when starved of oxygen (unlike humans that produce lactic acid, and plants that pretty much couldn’t care less). During the fermentation process, yeast initially grow in large numbers, utilising some of the sugars in the wash, along with any spare oxygen. When the oxygen runs out, their metabolism flips into survival mode, at which time they start breaking down any remaining sugars to produce ethanol along with a huge array of other compounds. Additionally, many yeast die and break open during this high stress stage of fermentation, further increasing the molecular diversity of the mix. Many of these compounds are harmless and indeed desirable, contributing to the flavour and complexity of the spirit. However, some compounds are undesirable and occasionally toxic, such as acetone, methanol and of course, sulphites. Methanol and acetone can easily be removed during the distillation process as their boiling points are lower than ethanol and as such they are the first compounds to be fractionated off during distillation, and removed with the first cuts. Tiny amounts may sometimes remain in the final product, but in quantities too minute to be harmful to humans. This is of course assuming the distillers know what they are doing! Patena on moonshine boiler. If your still looks like this, you need to audit your maintenance practices. Sulphites are a different story and humans are particularly sensitive to their presence. Even tiny concentrations are detectable to human senses, rendering the spirit unpleasant. This is where the chemical properties of copper are critical. Sulphites will initially react with hydrogen ions within the liquid to produce hydrogen-sulphide which gives the unpleasant “rotten egg” odour and is toxic and highly flammable. Hydrogen sulphide is capable of reacting with many metal ions, one of which is copper. The resulting compounds are insoluble and so precipitate out to form copper sulphate, sacrificing a tiny amount of copper from the still in the process. The majority of this reaction happens in the “vapour” part of the still, where the spirit reaches its highest temperature before being condensed. This copper sulphate adheres to the internal surface of the copper in the still to form a patina, or thin layer of the compound. This patina can then be washed off during routine cleaning cycles. Pure copper plays a critical role in “cleaning up” the spirit, and the superiority over brass, aluminium, iron and stainless steel for the initial stages of distillation are evident in the final product. Stainless steel doesn’t react in the same way, but has similar properties with regard to malleability and heat conduction, but also other advantages when it comes to cost, strength and durability. Stainless steel is therefore ideal for production of stills to be used for distillation processes where removal of sulphites have already been carried out, such as the production of London Dry styles of gin. By definition, the style “London Dry Gin” begins the process of distillation with a neutral spirit that has already been refined and had many of the impurities, including sulphites removed. Hybrid stills involving a stainless steel boiler (for the “liquid” stages of distillation) along with other pure copper components (such as the head for the “vapour” stages of distillation) to some provide the best of both worlds - durable stills that also allow the flexibility during distillation to create the purest spirit possible for gin production. At Animus Distillery, we love our hybrid still, and invite anyone interested to visit and see us making our craft gins! Davidsonia Gin is coming! Release Date and pre-launch events announced!